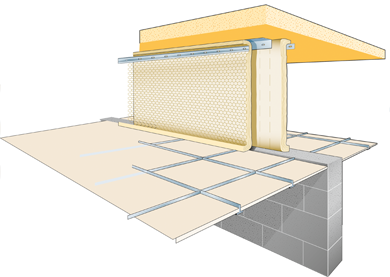 The Fire Barrier System is designed to restrict the passage of flames and smoke between suspended ceilings, floors or roofs. The fire barrier angle and flat strip system uses fire barrier quilt stitched with wire and faced on one side with 25mm galvanised wire mesh. Fire tests have been carried out at Warrington Fire Research Centre using Lancaster Fireshield and at the Building Research Establishment using Rockwool Fire Barrier.